What kind of nests do hornets have? Jump Menu: What kind of nests do hornets have? Reviews Will you retreat a wasp nest if unsuccessful? When to seal wasp nest entrance? Can you rehome hornets nests? Hornets build similar nests to wasps. The only difference being that a hornet nest has an open bottom. They do not form a complete shroud around the nest as wasps do. Will you retreat a wasp nest if unsuccessful? If we treat your wasp nest, we guarantee to kill it. In the rare case that your nest is still live 48 hours after we have treated it, we will return and retreat at no further cost to you. When to seal wasp nest entrance? If you need to seal the entrance to a wasp nest, you must wait until after the nest has been treated and all activity has ceased. Can you rehome hornets nests? 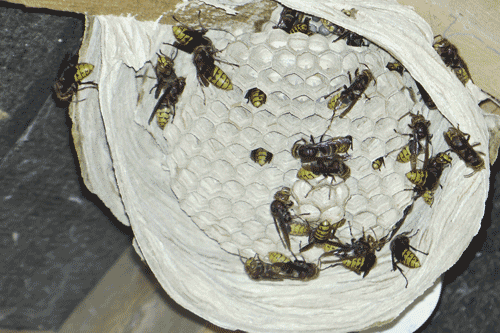 Both wasp and hornet nests cannot be rehomed in the same way as bees can. If you have a nest and want it gone, the only way is to treat (kill) it.